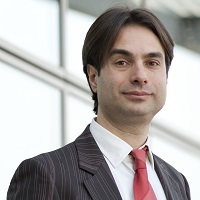 Vangelis Souitaris is a Professor of Entrepreneurship at Cass Business School. He founded the Entrepreneurship group at Cass and he is the current subject-group leader. He joined in 2004 and became Cass’s youngest full professor in 2006 (age 34). Before Cass, Vangelis spent 6 years as an assistant professor at Imperial College London. He currently holds a visiting chair at the University of St. Gallen in Switzerland. Vangelis also visited on sabbatical LBS (2015-16), Wharton (2008-09), Bologna (2008), and Vlerick (2005). In 2011, he was recognized as one of the top 40 business school professors under 40 years old, by the online business education magazine “Poets and Quants”. As the PhD director (2011-15) he has instrumental in the academic transformation of the Cass PhD programme (extending the duration to 4 years, introducing formal training and scholarships). Vangelis brings his expertise to practice by advising large Technology Businesses (such as IBM and Telenor) and also small technology startups that spin-out from engineering universities. He has supervised/currently supervising 9 PhD students. If you are interested in a PhD in Entrepreneurship (and/or more specifically in technology entrepreneurship) please contact Vangelis directly. My research focuses on behavioral and social explanations of major entrepreneurial decisions. Bellavitis, C., Filatotchev, I. and Souitaris, V. (2017). The Impact of Investment Networks on Venture Capital Firm Performance: A Contingency Framework. British Journal of Management, 28(1), pp. 102–119. doi:10.1111/1467-8551.12162 . Nicolaou, N. and Souitaris, V. (2016). Can Perceived Support for Entrepreneurship Keep Great Faculty in the Face of Spinouts. Journal of Product Innovation Management, 33(3), pp. 298–319. doi:10.1111/jpim.12274 . Pitsakis, K., Souitaris, V. and Nicolaou, N. (2015). The Peripheral halo effect: Do academic spinoffs influence universities' research income? Journal of Management Studies, 52(3), pp. 321–353. doi:10.1111/joms.12119 . Souitaris, V. and Maestro, B.M.M. (2011). The case for multitasking. Harvard Business Review, 89(10). Souitaris, V. and Maestro, B.M.M. (2010). Polychronicity in top management teams: The impact on strategic decision processes and performance of new technology ventures. Strategic Management Journal, 31(6), pp. 652–678. doi:10.1002/smj.831 . Al-Laham, A. and Souitaris, V. (2008). Network embeddedness and new-venture internationalization: Analyzing international linkages in the German biotech industry. Journal of Business Venturing, 23(5), pp. 567–586. doi:10.1016/j.jbusvent.2007.09.001 . Zhang, J., Souitaris, V., Soh, P.H. and Wong, P.K. (2008). A contingent model of network utilization in early financing of technology ventures. Entrepreneurship: Theory and Practice, 32(4), pp. 593–613. doi:10.1111/j.1540-6520.2008.00244.x . Djokovic, D. and Souitaris, V. (2008). Spinouts from academic institutions: A literature review with suggestions for further research. Journal of Technology Transfer, 33(3), pp. 225–247. doi:10.1007/s10961-006-9000-4 . Zerbinati, S. and Souitaris, V. (2005). Entrepreneurship in the public sector: A framework of analysis in European local governments. Entrepreneurship and Regional Development, 17(1), pp. 43–64. doi:10.1080/0898562042000310723 . Souitaris, V. and Cohen, M. (2003). Internet business or just business? Impact of Internet-specific strategies on venture performance. European Management Journal, 21(4), pp. 421–437. doi:10.1016/S0263-2373(03)00080-X . Souitaris, V. (2002). Technological trajectories as moderators of firm-level determinants of innovation. Research Policy, 31(6), pp. 877–898. doi:10.1016/s0048-7333(01)00154-8 . Wilson, D. and Souitaris, V. (2002). Do Germany's federal and land governments (still) co-ordinate their innovation policies? Research Policy, 31(7), pp. 1123–1140. doi:10.1016/S0048-7333(01)00181-0 . Souitaris, V. (2002). Firm-specific competencies determining technological innovation. A survey in Greece. R&D Management, 32(1), pp. 61–77. doi:10.1111/1467-9310.00239 . Souitaris, V. (2001). Strategic Influences of Technological Innovation in Greece. British Journal of Management, 12(2), pp. 131–147. doi:10.1111/1467-8551.00190 . Whewell, J.A. and Souitaris, V. (2001). The impact of Internet trading on the UK antiquarian and second-hand bookselling industry. Internet Research, 11(4), pp. 296–309. doi:10.1108/10662240110402759 . Souitaris, V. (2001). External communication determinants of innovation in the context of a newly industrialised country: a comparison of objective and perceptual results from Greece. Technovation, 21(1), pp. 25–34. doi:10.1016/S0166-4972(00)00014-6 . SOUITARIS, V.A.N.G.E.L.I.S. (1999). RESEARCH ON THE DETERMINANTS OF TECHNOLOGICAL INNOVATION: A CONTINGENCY APPROACH. International Journal of Innovation Management, 03(03), pp. 287–305. doi:10.1142/s1363919699000153 . Souitaris, V. and Pujari, D. (1998). Strategic environmental management in the Greek chemical industry: results from an exploratory study of selected companies. Business Strategy and the Environment, 7(3), pp. 134–149. doi:10.1002/(SICI)1099-0836(199807)7:33.0.CO;2-T .
Defazio, D. and Souitaris, V. (2010). Learning to spin-off by learning to license: Individual learning processes in capability formation. Strategic Management Society Conference Rome Italy. Pitsakis, K. and Souitaris, V. (2009). Spinoff diffusion and the social construction of university funding. Babson College Entrepreneurship Research Conference Babson College, Boston. Pitsakis, K. and Souitaris, V. (2009). Lack of norms, mimicry and the diffusion of educational innovations: The UK Spinoffs. Academy of Management Chicago. Souitaris, V. and Defazio, D. (2008). Licensing or spinoffs? Success and failure experiences and the development of alternative capabilities in technology transfer organizations. Babson 2008 North Carolina. Djokovic, D. and Souitaris, V. (2007). The effects of market and technological uncertainty on university spinout formation: A real option approach to technology commercialization. Academy of Management Conference Philadelphia. Maestro, M., Liu, G. and Souitaris, V. (2007). Determinants & Consequences Of Speed In Developing Dynamic Capabilities In New Technology Ventures. Babson Conference 2007 Madrid. Moray, N., Clarysse, B., Zerbinati, S. and Souitaris, V. (2006). Nature or Nurture? The Growth Paradox of Research-Based Spin-Offs. 26 Babson Entrepreneurship Research conference Bloomington Indiana. Djokovic, D. and Souitaris, V. (2006). The effects of market and technological uncertainty on university spinout formation: A real option approach to technology commercialization. 26 Babson Entrepreneurship Research conference Bloomington Indiana. Moray, N., Clarysse, B., Zerbinati, S. and Souitaris, V. (2006). Why Research-Based Spin-Offs grow? IAMOT Conference Beijing. Maestro, M., Liu, G. and Souitaris, V. (2005). Polychronicity in top management teams. The impact on strategic decision making processes and outcomes in new ventures. 25 Babson Kauffman Entrepreneurship Research Conference Babson College. Zerbinati, S. and Souitaris, V. (2005). Do entrepreneurship programmes raise intentions of science and engineering students? Academy of Management Conference Hawai, USA. Zerbinati, S. and Souitaris, V. (2004). The effect of entrepreneurship education on entrepreneurial attitudes, intentions and start-up activities of engineering students. 24 Babson Kauffman Entrepreneurship Research Conference Glascow Scotland. Zerbinati, S. and Souitaris, V. (2002). Entrepreneurship in the public sector. Small Business and Entrepreneurship Development Conference Nottingham 15-16 April. Zerbinati, S. and Souitaris, V. (2002). Entrepreneurship in the public sector: An empirical analysis of local governments in the UK and Italy. 22nd Babson Kauffman Entrepreneurship Research Conference Boulder Colorado. Daskalopoulos, T. and Souitaris, V. (2001). Managing Science and Technology Parks in low-tech environments: a resource-based strategic mapping framework. Portland International Conference in Management of Engineering and Technology (PICMET) Portland Oregon, July 29 - August 3. Whewell, J. and Souitaris, V. (2001). The impact of Internet Trading on the UK Antiquarian and Second-hand Bookselling Industry. The 22 McMaster world congress (e-commerce) Hamilton - Ontario, Canada, January 17-19. Souitaris, V. (2000). Strategic determinants of Innovation in Greece. Innovation and Entrepreneurship Policies in the European Periphery Volos Greece, May 26-27. Souitaris, V. (2000). Application of a sectoral taxonomy to explore contingencies in the theory of determinants of innovation. IEEE International Conference on Management of Innovation and Technology (ICMT 2000) Singapore, November 12-15. Souitaris, V. (2000). External communication determinants of innovation in the context of a newly industrialised country: The case of Greece. 9th International Conference of Management of Technology Miami, Florida, February 20-25. Souitaris, V. (1999). Corporate decision-making factors determining technological innovation: A survey in Greece. British Academy of Management Conference Manchester, September 1-3. Souitaris, V. (1999). Firm-specific competencies determining technological innovation. Results from a survey in Greece. R&D Management Conference 'R&D as a business' New Delhi, December 6-8. Souitaris, V. (1997). The issue of Determinants of Technological Innovation re-examined. Current State of the Art, Modern Research Trends and Future Prospects. R&D Management Conference. Managing R&D into the 21st Century Manchester Conference Centre, July 14-16. Souitaris, V. (1997). The issue of Determinants of Technological Innovation re-examined. Prospects of research in Japan. Conference Proceedings: European Institute of Japanese Studies Budapest, August 27-30. Souitaris, V. and Daskalopoulos, T. (2000). Managing science and technology parks in low-tech environments: a resource-based strategic mapping framework. International Journal of Manufacturing Technology and Management, 2(1/2/3/4/5/6/7), pp. 0–0. doi:10.1504/ijmtm.2000.001388 . Member of the editorial board of the Journal of Management Studies, Editorial board member, Jan 2017 – present. Entrepreneurship Theory and Practice, Member of Editorial Board, 2015 – present. Academy of Management Journal, Referee, 2012 – present. Strategic Management Journal, Referee, 2010 – present. Journal of Business Venturing, Referee, 2004 – present. Research Policy, Referee, 2004 – present. European Management Journal, Member of Editorial Board, 2003 – 2011. R&D Management, Referee, 2002 – present. Invited presentations at Kingston University (2013), Norwich Business School (2014), University of Bath (2015), London Business School (2016). (2016). Invited speaker. Academy of Management Conference 2016 in Anaheim California. (Conference) California, USA (2016). Co-authors: Filatotchev, I., Souitaris, V.
Academy of Management Conference 2016 in Anaheim California. (Conference) California USA (2016). Paper: To be a specialist or a generalist? A discussion of categorical imperative mechanism on entrepreneurial IPO performance. Co-authors: Zerbinati, S., Souitaris, V.
Babson Entrepreneurship Research conference Conference, Bodo Norway. (Conference) Bodo, Norway (2016). Co-authors: Souitaris, V., Bo, P.
the Academy of Management Conference 2016, Anaheim California. (Conference) California, USA (2016). Paper: Does engagement in entrepreneurship increase life-stress? Co-authors: Nicolaou, N. and Souitaris, V.
Academy of Management Conference 2015 in Vancouver. (Conference) Vancouver, Canada (2015). ACERE Entrepreneurship conference 2015 in Australia, where the paper won the best paper award. (Conference) (2015). Co-authors: Souitaris, V., Knockaert, M.
Babson Entrepreneurship Research Conference 2015, Babson College. (Conference) Boston USA (2015). Invited presentations at London Business School (2013), Warwick Business School (2014), Strathclyde University (2012), LUISS University in Rome (2014), and the University of Cyprus (2012). (Seminar) (2014). Invited speaker. Academy of Management Conference, Philadelphia. 2014. (Conference) Philadelphia, USA (2014). Invited presentations at Imperial College London (2011) and ESADE (2012). (2012). Invited speaker. Strategic Management Society Conference. (Conference) Rome Italy (2010). Academy of Management, Annual Meeting, Montreal, Canada, 6-10 August. (Conference) Montreal, Canada (2010). Academy of Management, Annual Meeting, Montreal, Canada, 6-10 August. (Conference) Montreal (2010). European Academy of Management, Annual Conference, Rome, Italy, 19-22 May. (Conference) Rome (2010). Babson conference. (Conference) Babson College, Boston (2009). Paper: Spinoff diffusion and the social construction of university funding. Babson 2008. (Conference) North Carolina (2008). Babson Conference 2007. (Conference) Madrid (2007). IAMOT Conference. (Conference) Beijing (2006). Paper: Why Research-Based Spin-Offs grow? 26 Babson Entrepreneurship Research conference. (Conference) Bloomington Indiana (2006). 26 Babson Entrepreneurship Research. (Conference) Bloomington Indiana (2006). Co-authors: Moray, N. Clarysse, B. and Zerbinati, S.
Academy of Management. (Conference) Hawai, USA (2005). Paper: Do entrepreneurship programmes raise intentions of science and engineering students? 25 Babson Kauffman Entrepreneurship Research. (Conference) Babson College (2005). 24 Babson Kauffman Entrepreneurship Research. (Conference) Glascow Scotland (2004). Small Business and Entrepreneurship Development Conference. (Conference) Nottingham 15-16 April (2002). Paper: Entrepreneurship in the public sector. 22nd Babson Kauffman Entrepreneurship Research. (Conference) Boulder Colorado (2002). The 22 McMaster world congress (e-commerce). Hamilton - Ontario, Canada, January 17-19 (2001). Portland International Conference in Management of Engineering and Technology (PICMET). (Conference) Portland Oregon, July 29 - August 3 (2001). Innovation and Entrepreneurship Policies in the European Periphery. Volos Greece, May 26-27 (2000). IEEE International Conference on Management of Innovation and Technology (ICMT 2000). (Conference) Singapore, November 12-15 (2000). 9th International Conference of Management of Technology. (Conference) Miami, Florida, February 20-25 (2000). Paper: External communication determinants of innovation in the context of a newly industrialised country: The case of Greece. R&D Management Conference 'R&D as a business'. (Conference) New Delhi, December 6-8 (1999). British Academy of Management Conference. (Conference) Manchester, September 1-3 (1999). R&D Management Conference. Managing R&D into the 21st Century. (Conference) Manchester Conference Centre, July 14-16 (1997). Conference Proceedings: European Institute of Japanese Studies. (Conference) Budapest, August 27-30 (1997). TodayÕs entrepreneur Ð born or built? (2014) SME Advisor. Multitasking kann sich im gehobenen Management positiv auf Unternehmens auswirken. (2012) www.medizin-aspekte.de (website). Chi fa piu cose insieme fa molto e lo fa bene. (2012) Panorama Economy- Italy. Cass's Dubai Centre targets potential entrepreneurs. (2012) www.eyeofriyadh.com (website). Cass Dubai Centre targets potential entrepreneurs. (2012) www.godubai.com (website). Cass's Dubai Centre targets potential Entrepreneurs. (2012) www.uaetoday.com (website). Cass's Dubai Centre targets potential entrepreneurs. (2012) www.emirates247.com (website). Multitasking furht zu besseren Ergebnissen. (2012) www.produktion.de (website). Multitasking kann sich im gehobenen Management positiv auf das Unternehmens auswirken. (2012) www.arzt-aspekte.de (website). Multitasker schaffen mehr. (2012) www.karrieremagazine.net (website). Multitasking-Fuhrungskrafte erreichen bessere Resulatate. (2012) www.haufe.de (website). The case for multitasking. (2011) Harvard business review (magazine).